A landlord and tenant decide how much the rent will be and which services will be included in the rent (for example, parking, cable, heat, electricity). Both parties have to determine the date when rent is due and the way of rent delivery. Paying rent on time: Verbal or written tenancy agreement should be clear about: the day that rent payments are due; the way on how rent payment is to be delivered to the landlord; and the method of payment. It is very important that rent payments are made on time. The rent is late if the full amount is not paid by midnight on the day it is due. A landlord does not have to accept partial payment of rent. Payments are usually made by either cash or cheque. The tenant must deliver the rent payment to a place agreed to or set by the landlord. If a rent payment is mailed, the tenant should mail it in advance so that it gets to the landlord by the due date. The tenant should allow at least five days for delivery. A landlord must give the tenant a receipt for any rent payment. Tenant is not allowed to withhold rent: A tenant should not withhold any part of the rent, even if the tenant feels that maintenance is poor or a necessary repair has not been done. A tenant could be evicted, if they withhold rent without getting approval from the Landlord and Tenant Board. Receipt for payment: A landlord shall provide free of charge to a tenant or former tenant, on request, a receipt for the payment of any rent, rent deposit, arrears of rent or any other amount paid to the landlord. Increase void without notice: A landlord must give at least 90 days notice in writing of any rent increase. An increase in rent is void if the landlord has not given the notice required by the Residential Tenancies Act. The landlord must give a new notice before the landlord can take the increase. 12-month rule: In most cases, a landlord who is lawfully entitled to increase the rent charged to a tenant for a rental unit may do so only if at least 12 months have elapsed, since the day of the last rent increase for that tenant in that rental unit, if there has been a previous increase; or since the day the rental unit was first rented to that tenant. Rent increase guideline: There is the rent increase guideline which is set each year by the Ontario Government. It is based on the Consumer Price Index. Each year, the Government announces the guideline by August 31st for rent increases that will take effect on or after January 1st of the following year. 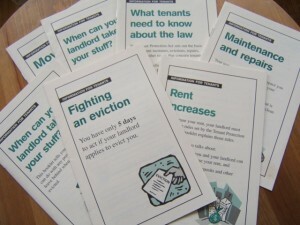 A landlord can apply to the Landlord and Tenant Board for an increase above the guideline if: 1) the landlord’s costs for municipal taxes and charges, and/or utilities (such as fuel, electricity or water) have increased significantly; or 2) the landlord has done major repairs or renovations (these are called capital expenditures); or 3) the landlord has operating costs for security services performed by persons who are not employees of the landlord. General: A landlord can collect a rent deposit from a new tenant on or before the start of a new tenancy. Where the tenant pays rent by the month, the deposit cannot be more than one month’s rent; where the tenant pays rent by the week, the deposit cannot be more than one week’s rent. The rent deposit can only be used as the rent payment for the last month or week before the tenant moves out. It cannot be used for anything else, such as repairing damage to the rental unit. If the landlord gives the tenant a notice to increase the rent, the landlord can also ask the tenant to increase the rent deposit by the same amount. Landlord must pay the tenant interest on the rent deposit every year. Security deposits: The only security deposit that a landlord may collect is a rent deposit. “Security deposit” means money, property or a right paid or given by, or on behalf of, a tenant of a rental unit to a landlord or to anyone on the landlord’s behalf to be held by or for the account of the landlord as security for the performance of an obligation or the payment of a liability of the tenant or to be returned to the tenant upon the happening of a condition. Rent deposit: A landlord may require a tenant to pay a rent deposit with respect to a tenancy if the landlord does so on or before entering into the tenancy agreement. The amount of a rent deposit shall not be more than the amount of rent for one rent period. If the lawful rent increases after a tenant has paid a rent deposit, the landlord may require the tenant to pay an additional amount to increase the rent deposit. A landlord shall pay interest to the tenant annually on the amount of the rent deposit. Rent deposit, prospective tenant: A landlord shall repay the amount received as a rent deposit in respect of a rental unit if vacant possession of the rental unit is not given to the prospective tenant. A subtenant may apply to the Landlord and Tenant Board as if the subtenant were the tenant and the tenant were the landlord. A tenant is responsible for ordinary cleanliness of the rental unit, except to the extent that the tenancy agreement requires the landlord to clean it. The tenant has to keep the home in a way that most people think is clean. A tenant is responsible for the repair or fix of undue damage to the rental unit or residential complex. The tenant must repair or pay for the repair of any damage to the rental property caused by the tenant, the tenant’s guest or another person who lives in the rental unit. This includes damage in the tenant’s unit, as well as any common area such as a hallway, elevator, stairway, driveway or parking area. It does not matter whether the damage was done on purpose or by not being careful enough – the tenant is responsible. However, the tenant is not responsible to repair damage caused by normal “wear and tear”. For example, if the carpet has become worn after years of normal use, the tenant would not have to replace the carpet. Garbage removal: One of the biggest problem areas for landlords is improper removal of garbage. In addition to being unsanitary, uncollected garbage makes the rental property look run-down. The rules should clearly state how frequently garbage must be removed and where garbage should be placed for removal. A tenant should not disturb others who live in the same building. A tenant shall not harass, obstruct, coerce, threaten or interfere with a landlord. A landlord shall not alter the locking system on a door giving entry to a rental unit or residential complex or cause the locking system to be altered during the tenant’s occupancy of the rental unit without giving the tenant replacement keys. A landlord cannot lock a tenant out of their rental unit unless the landlord has an eviction order from the Landlord and Tenant Board and the Sheriff comes to the rental unit to enforce it. A tenant shall not alter the locking system on a door giving entry to a rental unit or residential complex without the consent of the landlord. The tenant is not allowed to change the locking system on the door that gives entry to the rental unit unless they get their landlord’s permission. In Canada, every individual has a right for privacy which is protected by the Canadian Charter of Rights and Freedoms, the Privacy Act and other laws. According to the law, a landlord has to provide a tenant with their privacy. A landlord is not allowed to enter a rental unite without written notice. The landlord may enter a rental unit in accordance with written notice given to the tenant at least 24 hours before the time of entry. for any reasonable purpose allowed by the rental agreement. The notice must include the reason why the landlord wants to enter the rental unit and must state what time, between 8 a.m. and 8 p.m., the landlord will enter the unit. If the landlord gives the tenant the correct notice, the landlord can enter even if the tenant is not at home.